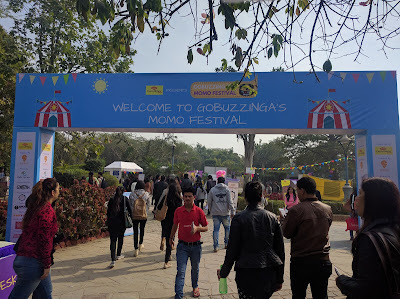 Go Buzzinga and Delhi Food Walks recently organized a festival inspired from the street food where different varieties of momos were brought under the same roof at Garden of Five Senses, Saket, New Delhi. We being Event Management students decided to checkout the event and observe the event unraveling. The event saw foodies from all over Delhi hanging around and feeding on delicious fusion of momos like Tandoori and Afghani momos, baked, fried, dipped in chocolate momos, vodka momos and what not with some amazing twists. A perfect “momoment” for the momo lovers along with full on entertainment and celebration. We absolutely loved the innovative vendors who had participated in the GoBuzzinga momos festival, “Bigger and Better”. “We are passionate about trying new things and are always discovering best things to do in the city for our GoBuzzinga community through sourced recommendations and curated events.To engage with our community offline we organise events such that explore nooks and corners of vibrant Delhi," says Hunar Katoch, co-founder of GoBuzzinga. Maggie cup-a-licious soups was the main sponsor for the GoBuzzinga momos festival, which was also presented by Swiggy. There were plenty more sponsors like Delhi Tourism, The Education Tree, Daily Bhaskar, Spoon University and many more. We noticed that on the stage that had been set up, there were many people clicking selfies with the attractive backdrop in the background. The stage worked as a brilliant selfie zone. However, as is the case with all events in Delhi, crowd management was not good and people had to wait a lot for their plate of happiness. In addition, the signages were not placed properly because of which people had to suffer a lot. According to the crowd, the venue was not apt for organising this fest because they hadn’t anticipated such large numbers. But the fact is, if you are having free entry large numbers will turn up! And as they say, “But all’s well that ends well”; the event ended with some pulsating music which got the crowd dancing on their toes. People were full of excitement and as soon as the DJ took over the event, there was a palpable energy that buzzed through the crowd. This unique event revolving around Momos, was simply marvellous and absolutely impossible to stay away from. We would love to be a part of more such novel events in days to come.